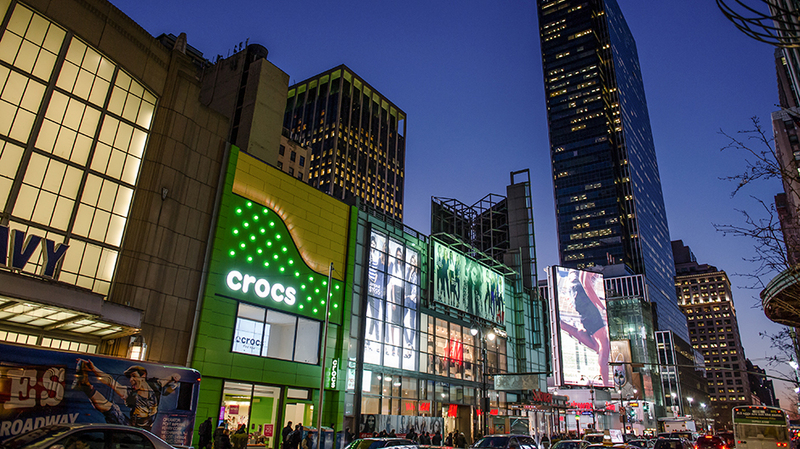 New York City, the fashion capital of the US, has a lot of competition in the retail market, particularly in storefronts. 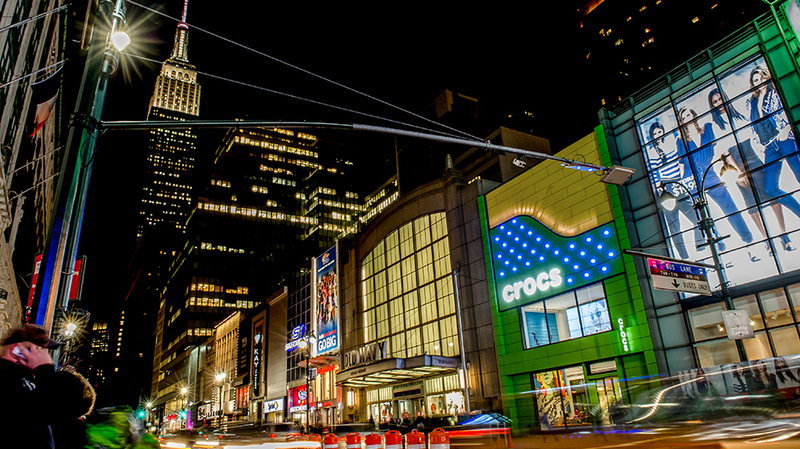 With this in mind, TPG Architecture was tasked with creating a captivating exterior façade for the Crocs Flagship Retail Store. Embodying the company’s colorful shoe brand, the façade is the perfect complement to the brand’s identity. 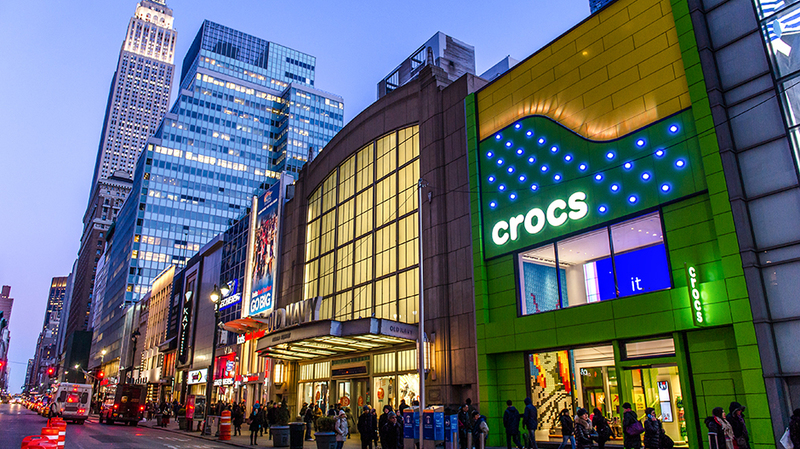 The vibrant ALPOLIC/fr aluminum composite panels in Yellow, Black and Custom Crocs Green, envelop the 13,600 square-foot storefront exterior. 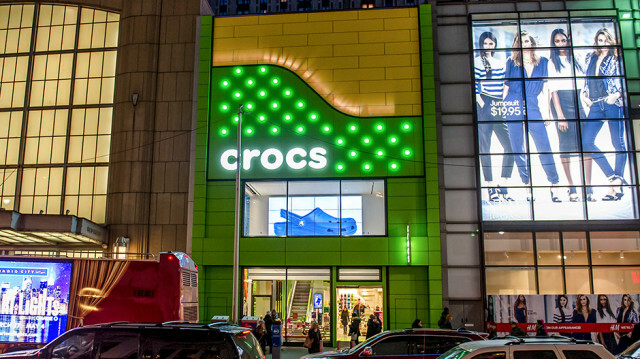 The architects designed the store to mimic the classic profile of a Crocs clog, explain ALPOLIC representatives. The vibrancy of the panels is in large part due to Valpar’s Valflon coatings system utilizing Lumiflon FEVE resin technology. Unlike PVDF, Lumiflon resins have a higher gloss range, which allows for unparalleled color vibrancy and retention. With retail construction in such high use throughout the year, it is important to choose a coating system that will last as long as possible to avoid expensive and bothersome recoating. With ALPOLIC’s custom color matching capabilities, the fabricators at Kenneth J. Herman Inc. were able to supply a Pantone value of Crocs signature green color and upon approval, Valpar’s Valflon coating system, with an advanced die coating process, was applied to the panels to achieve a custom finish. While the custom coloring was completed with ease the fabrication of the façade presented more of a challenge. Working closely between the fabricators and ALPOLIC, the panels black borders and dozens of custom light-fixture cutouts were achieved as well. In any competitive market it is important to emerge with innovative design strategies. TPG Architecture, Kenneth J Herman, Inc ALPOLIC and Valspar worked in unison to create a unique storefront façade that not only embodies the brand itself but entices passersby as well. Valspar® High Performance Architectural Coatings, The Valspar Corporation is one of the largest global coatings manufacturers in the world, providing coatings and coating intermediates to a wide variety of customers. Since 1806, Valspar has been dedicated to bringing customers the latest innovations, the finest quality, and the best customer service in the coatings industry. ALPOLIC®, Mitsubishi Plastics Composites America, Inc.; Chesapeake, Virginia, one of the world’s leading manufacturers of aluminum composite and metal composite materials. The high quality materials are manufactured in Japan, Germany and the United States. The Chesapeake, Virginia facility began production in 1991 and continues to set the North American standard for innovation and quality.